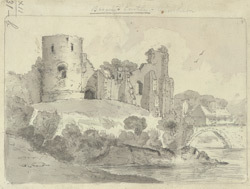 View of the impressive ruins of Barnard Castle in County Durham. As the castle was on a large plateau surrounded by cliffs and a ravine, it was well defended. It was built in c.1125-1140 by a Norman, Bernard Baliol, from whom the town's name comes from. It was taken by Edward I, and then passed to several royal and aristocratic owners, but after the 14th century, it was not regularly used. In the 17th century the castle was partly dismantled by the Vane family, in order to provide stone for Raby Castle.